Art Talk: Party Time Tuesday... A little late Love! It's Party Time Tuesday! 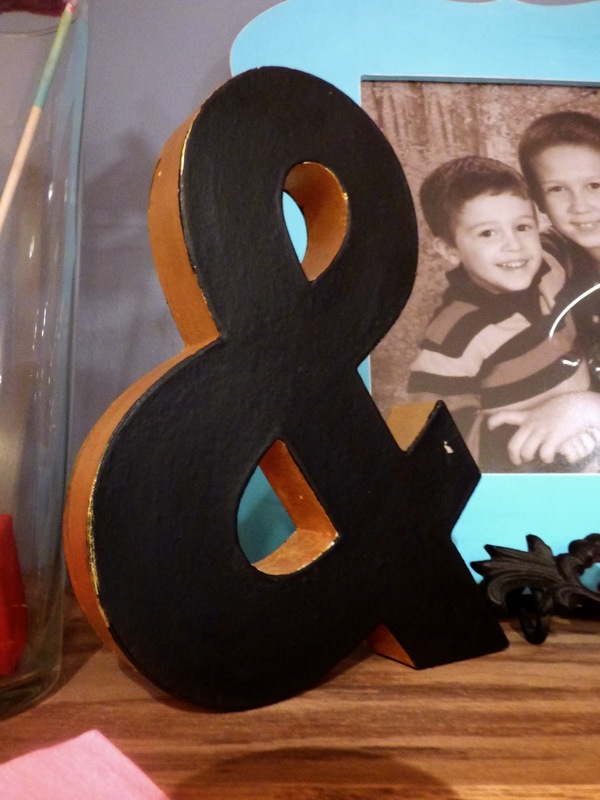 Over at the Party Time blog, I am sharing a Pinterest-inspired project. I love decorating my mantel and house for the holidays. 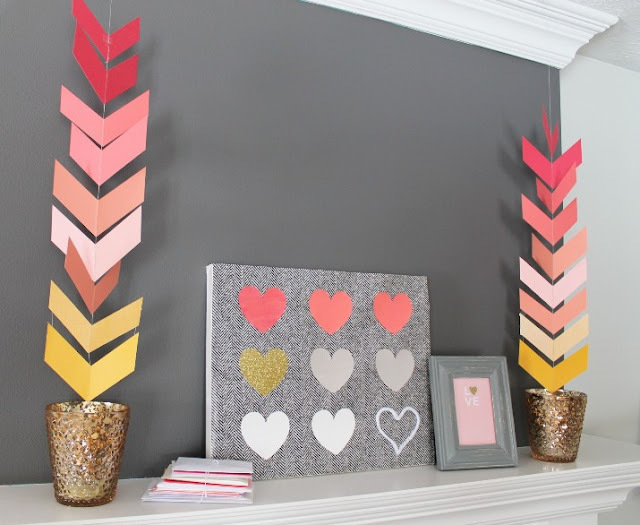 Valentine's Day needed some new decor so I searched Pinterest and found an adorable chevron/ arrow inspiration here. This is the image that got me excited for my holiday banner! Isn't it adorable? I love the color scheme... pink, red, aqua, grey, and ivory. Just makes me smile! You can see how the banner is attached here... held on under a glass vase. LOL! I filled the vace with handmade arrows. 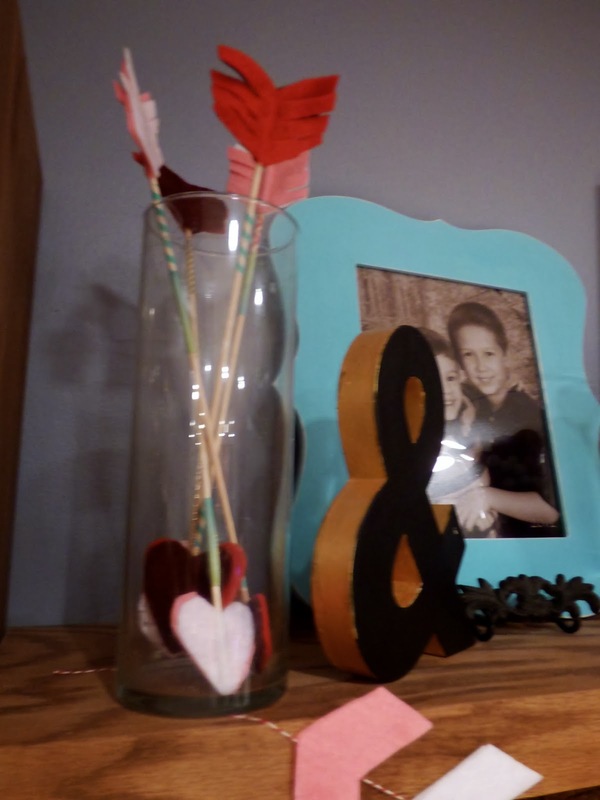 Thin wooden dowels, felt hearts, small chevrons with feathery edges, and washi tape. Found this baby at Michaels and painted it up with Faber-Castell Design Memory Craft's Textural Accents Chalkboard Paint and Gold paint. So, to make this cutie banner, I cut chevron pieces out of the different colors... basically I made a cardboard tracer and folded the felt in half and cut half. When I opened it, there was a perfectly symmetrical arrow shape. I used the same color on the front and back. Put a little glue in the center and lay the twine between the layers. I spaced them out a bit to allow them to twirl as they wanted. Here you can see the pattern of color. I made it too long so I cut a bit to drape over the chalkboard frame and added some to a wreath I made too! I hope you liked the project! Now, go on over the Party Time Tuesday Blog and participate in our Pinterest challenge!!! You know you spend enough time over there on Pinterest, so have a party, make your own decor or art project based on inspiration you've pinned and link us up! You can win a prize!